New Years Day 2014 On Nickelodeon UK, Nicktoons And Nick Jr.
To celebrate the first day of a fresh new year (Wednesday 1st January 2014), Nickelodeon UK, Nicktoons and Nick Jr. have unveiled their New Years Day schedule highlights, which are packed full of everybody's favourite shows, to make sure everyone can celebrate the very start of 2014 Nickelodeon Style! Nickelodeon UK's animation and action channel, NickToons UK and Ireland, will be celebrating New Year's Day with a special Spongy "SpongeBob SquarePants" marathon from 5:00am. Then, catch a explosive episode of "Beyblade Metal Masters" at 8:00pm, a action-packed episode of "Power Rangers Megaforce" 8:30pm and back-to-back "SpongeBob" from 9:00pm. Then, Nicktoons UK will offer more help to viewers to write their New Years Resolution Lists for 2014 with two episodes of "Grizzly Tales for Gruesome Kids" from 10:00pm, and end the night with the Classic Nickelodeon original animated shows (Nicktoons) "Rocko's Modern Life", "Invader ZIM", and "The Ren & Stimpy Show"! Nickelodeon UK's preschool channels, Nick Jr. UK and Nick Jr. 2, will also be celebrating New Years Day by showing episodes of favourite Nick Junior UK shows all day, including "Peppa Pig", "Guess How Much I Love You", "Ben and Holly's Little Kingdom", "Rugrats", "Dora the Explorer", "Let's Go Pocoyo", "Dinosaur Train", "Tickety Toc", "Bubble Guppies", "Team Umizoomi", "Paw Patrol", "Pajanimals", "Max & Ruby", "Humf", "Go, Diego, Go! ", "Super Why! ", "Blue's Clues", "Olivia", "Thomas and Friends", "Louie", "Wonder Pets", "Little Bill", "Angelina Ballerina: The Next Steps", and "A Bedtime Story" featuring Denise Lewis reading the bedtime story "The Selfish Giant", Jenny Frost reading "The Ugly Duckling", and "The Go!Go!Go! Show" star Steve Leeds reading the bedtime story "My Cat's A Superhero", plus the special "Barbie" movie "Barbie as the Island Princess". Additionally, Nick Jr. and Nick Jr. 2 will be holding special "Peppa Pig" marathons throughout the day! Welcome to the NickALive! 's last Nickelodeon News Round-Up of 2013! Below is a selection of articles from around the internet which feature news, commentary and information about Nickelodeon, including news stories NickALive! didn't get time to report throughout the year. The Teenage Mutant Ninja Turtles return with all new episodes this February! According to the television news website TheFutonCritic.com, Nickelodeon USA will start airing all-new episodes from the second season of Nick Turtles from Sunday 2nd February 2014 at 11:00 AM (ET/PT). Follow NickALive! on Twitter, Tumblr, Google+, via RSS, on Instagram, and/or Facebook for the latest Nickelodeon, Teenage Mutant Ninja Turtles and SpongeBob SquarePants News! New Years Eve 2013 On Nickelodeon UK, Nicktoons And Nick Jr.
To celebrate the last day of the year (Tuesday 31st December 2013), Nickelodeon UK, Nicktoons and Nick Jr. have unveiled their New Years Eve schedule highlights, which is packed full of the biggest episodes and specials of everyones favourite shows and much more to make sure everyone can have a end of the year party Nickelodeon Style! Nickelodeon UK and Ireland and Nickelodeon HD UK will be celebrating the end of the year (New Years Eve) on Tuesday 31st December 2013 by showing some of the biggest episodes and specials of popular Nickelodeon shows, including the "iCarly" episode "iGo One Direction" and the "Sam & Cat" episodes "#Pilot" and "#RevengeOfTheBritBrats", the "Victorious" special "Freak The Freak Out" and "iShock The World". Then at 7:00pm, Nick will be treating British and Irish Directioners by airing the "One Direction: Up All Night" 1D live concert special! Then from 10:00pm, NickHeads can countdown to midnight with the one and only "SpongeBob SquarePants"! Nickelodeon UK's animation and action channel, NickToons UK and Ireland, will be celebrating New Year's Eve with a "SpongeBob SquarePants" marathon from 9.00am, a action-packed episode of "T.U.F.F Puppy" at 4.30pm, two back-to-back episodes of Nickelodeon's brand new CGI-animated "Teenage Mutant Ninja Turtles" television series from 6.00pm, then Nicktoons will hold a second "SpongeBob SquarePants" marathon from 7.00pm, which will include a special presentation of the "SpongeBob SquarePants" special "The Clash Of Triton" at 9.30pm, then, Nicktoons UK will offer to help viewers write their New Years Resolution Lists for 2013 with two episodes of "Grizzly Tales for Gruesome Kids", then NickToons will end the evening by holding a traditional End of the Year celebration featuring the Classic Nickelodeon original animated shows (Nicktoons) "Hey Arnold! ", "Invader ZIM", and "The Ren & Stimpy Show", as part of "Christmas On Nickelodeon 2013"! Nickelodeon UK's action channel, NickToons UK and Ireland, will be celebrating New Year's Eve under the sea with a all-day "SpongeBob SquarePants" marathon from 5:00am. Then, catch a explosive episode of "Beyblade Metal Masters" at 8:00pm, a action-packed episode of "Power Rangers Megaforce" 8:30pm and back-to-back "SpongeBob" from 9:00pm. Then, Nicktoons UK will offer to help viewers write their New Years Resolution Lists for 2014 with two episodes of "Grizzly Tales for Gruesome Kids" from 10:00pm, then NickToons will end the evening by holding a traditional End of the Year celebration featuring the Classic Nickelodeon original animated shows (Nicktoons) "Rocko's Modern Life", "Invader ZIM", and "The Ren & Stimpy Show", as part of "Christmas On Nicktoons UK 2013"! Nickelodeon UK's preschool channels, Nick Jr. UK and Nick Jr. 2, will also be celebrating New Years Eve by showing episodes of favourite Nick Junior UK shows all day, including "Peppa Pig", "Guess How Much I Love You", "Ben and Holly's Little Kingdom", "Rugrats", "Dora the Explorer", "Let's Go Pocoyo", "Dinosaur Train", "Tickety Toc", "Bubble Guppies", "Team Umizoomi", "Paw Patrol", "Pajanimals", "Max & Ruby", "Humf", "A Bedtime Story" featuring "The Go!Go!Go! Show" star Gemma Naylor reading the bedtime story "The Secret Club", comedian Jonny Vegas reading "The Boy Who Cried Wolf" and "Blue's Clues" host Kevin Duala reading the bedtime story "The Great Pillow Fight", "Go, Diego, Go! ", "Super Why! ", "Blue's Clues", "Olivia", "Thomas and Friends", "Louie", "Wonder Pets", "Little Bill", and "Angelina Ballerina: The Next Steps", plus the special "Barbie" movies "Barbie: Magic of the Rainbow" and "Barbie Fairytopia", and the "Dora the Explorer" special "Treasure Island"! Additionally, Nick Jr. 2 will be holding a special "Peppa Pig" marathon throughout the day, as part of "Christmas On Nick Jr. UK 2013"! * Super-charged Power Rangers lunch, which features Ranger training sessions with all five Power Rangers. * Up close and personal Power Rangers meet and greets. * Power Rangers-themed activities and crafts. * Sneak peek screening of an all-new episode of "Power Rangers Super Megaforce". In addition to the Power Rangers, guests can also have a blast with other Nickelodeon megastars on property. SpongeBob SquarePants, Dora the Explorer and The Teenage Mutant Ninja Turtles will be on hand to celebrate these aweslime weekends with meet and greets, live shows, games and prizes. Guests can book their "Power Rangers Super Megaforce" weekend stay by visiting NickHotel.com/Power-Rangers. 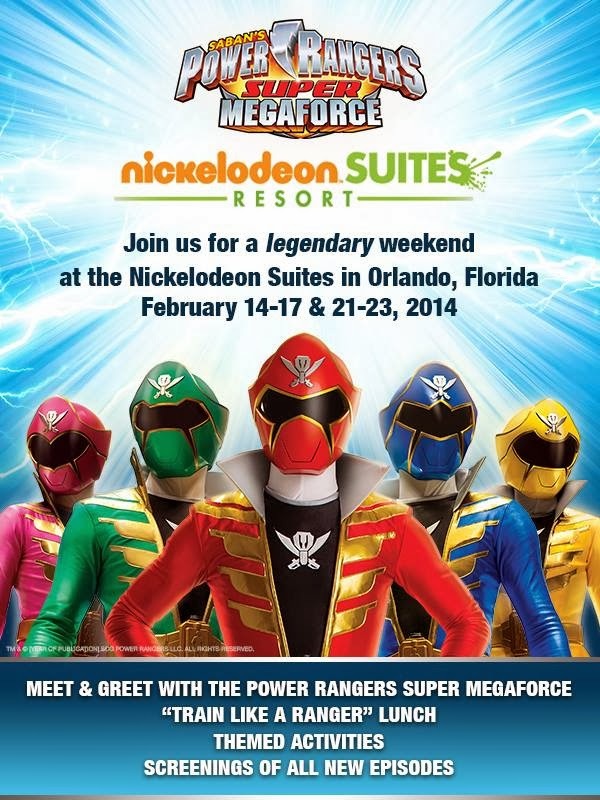 Are you planning to visit Nickelodeon Suites Resort to attend a special "Power Rangers Weekend"? Let NickALive! know on Twitter, Tumblr, Google+, Instagram, and/or Facebook! * Sneak peek screening of an all-new episode of Power Rangers Super Megaforce. In addition to the Power Rangers, guests can also have a blast with other Nickelodeon characters on property. SpongeBob SquarePants, Dora the Explorer and The Teenage Mutant Ninja Turtles will be on hand to celebrate these awesome weekends with meet and greets, live shows, games and prizes. "With the Power Rangers weekends, our new Nick Jr. Weekend and our Total Turtle Weekends, our guests will experience all of the excitement the Nick Hotel has to offer in 2014," said Tony Aslanian, director of sales and marketing for Nickelodeon Suites Resort. "We have several great packages to compliment these special event weekends that kids and families are sure to enjoy." 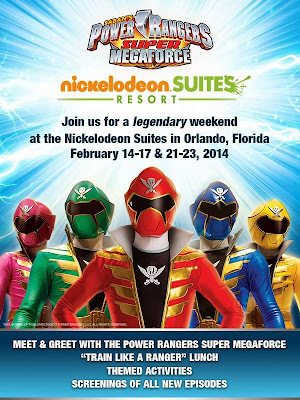 Guests can book their Power Rangers Super Megaforce weekend stay by visiting NickHotel.com/Power-Rangers. Join the Nick Hotel Club. Follow us on Twitter @nickhotel. Join our Nick Hotel Facebook Fan page. Additional photography is available upon request or by visiting Nick Hotel on Flickr. Located in the heart of Orlando’s tourism district, Nickelodeon Suites Resort, otherwise known as the Nick Hotel, is much more than a place for guests to lay their heads at night. From two over-the-top pool complexes with slides and flumes, to live entertainment and Character Breakfast featuring Nickelodeon's beloved characters, to a multimillion dollar 4-D Theater, to the colorfully themed Kid Suites and gallons upon gallons of slime, Nick Hotel offers nonstop activity from dawn to dusk for the entire family any time of the year. For more information about the Nick Hotel, visit www.nickhotel.com or call (877) NICK-KID. 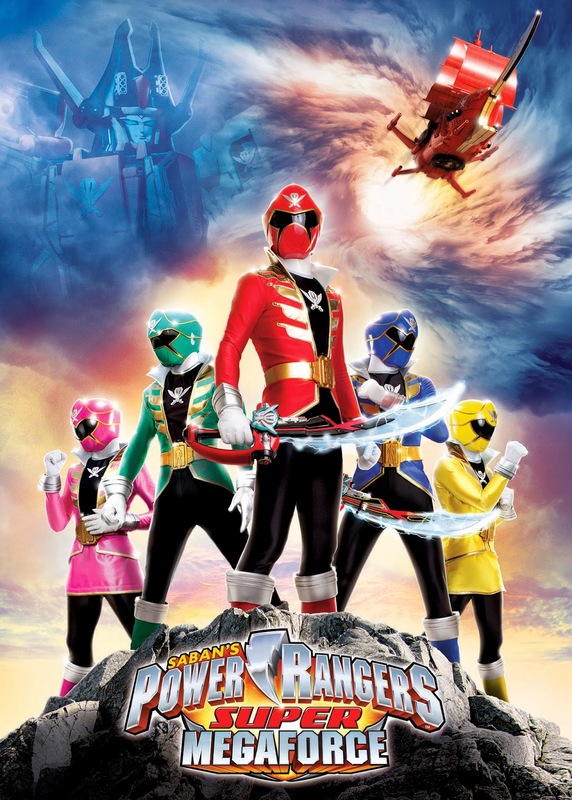 Saban Brands will launch the newest installment of the Power Rangers franchise, one of the top-rated and longest running boys live-action series on television, with Power Rangers Super Megaforce. The new series, which premieres on Nickelodeon in early 2014, will deliver super mega action, humor, excitement and entertainment, in addition to the core themes of friendship, teamwork, fitness and helping others. Power Rangers Super Megaforce will introduce all-new morphing abilities, allowing the Rangers to morph into any team of Power Rangers from the past. The Power Rangers franchise is helmed by Haim Saban, who created and produced the original Mighty Morphin Power Rangers series in 1993. SCG Power Rangers LLC, which licenses and merchandises the Power Rangers brand, is an affiliate of Saban Brands. For more information, visit www.powerrangers.com. Power Rangers Super Megaforce invades February 14-17 & 21-23 in 2014! Join your friends at the Nick Hotel as we POWER UP for Power Rangers Weekend with SUPER charged activities for those staying February 14-17 & 21-23, 2014. POWER RANGERS... DID YOU KNOW? * This is the 5th Power Rangers series to have the word FORCE in it's title, after Power Rangers Time Force, Power Rangers Wild Force, Power Rangers Mystic Force, and Power Rangers Super Megaforce. * "Fury of the dragon! Megaforce Red!" * "Flames of the phoenix! Megaforce Pink!" * "Venom of the snake! Megaforce Black!" * "Claw of the tiger! Megaforce Yellow!" * "Bite of the shark! Megaforce Blue!" * "Earth's defenders, never surrender! Power Rangers Megaforce!" * Finishing move: "Victory Charge!" Follow NickALive! on Twitter, Tumblr, Google+, via RSS, on Instagram, and/or Facebook for the latest Nickelodeon Suites Resort and Power Rangers News! 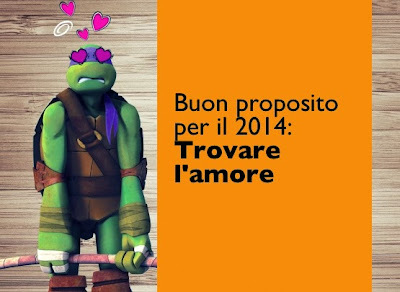 Nickelodeon Italy (Italia) has announced in a post on their official Nickelodeon Magazine (Nick Magazine) blog which talks about the New Year's resolutions which your favourite Nickelodeon Stars may be making for 2014 the Booyakasha TMNT news that Nick Italy, the Italian version of the world's number one kids' channel, will start to premiere and show brand new episodes from "Teenage Mutant Ninja Turtles" ("Tartarughe Ninja") season two from February 2014, continuing the shell-raising crime-fighting adventures of the four mutant Heroes in a Half-Shell turtle brothers — Leonardo, Raphael, Donatello and Michelangelo! Riuscirà Donnie a conquistare April nel 2014? Lo scopriremo da febbraio nei nuovi episodi delle Tartarughe Ninja! Will Donnie to win in April 2014? We'll find out in February in the new episodes of Ninja Turtles! Follow NickALive! on Twitter, Tumblr, Google+, via RSS, on Instagram, and/or Facebook for the latest Nickelodeon Italy and Teenage Mutant Ninja Turtles News! Fare un sacco di guai! Do a lot of trouble! 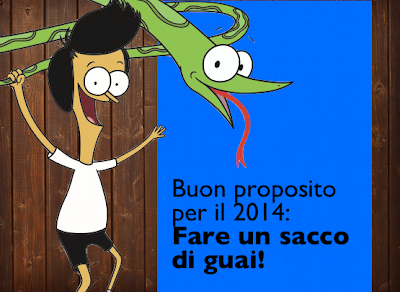 To celebrate the Italian debut of "Sanjay and Craig" in February 2014, Nick Italy unveiled a special online streaming video clip featuring a preview of the brand new Nick show as part of their "Calendrier de l'avent" online Christmas Advent Calendar, which NickHeads located in Italy can watch here on NickTV.it (click on Day 23)! Nickelodeon Italia's all-new official "Sanjay & Craig" show webpage features a 'Meet The Characters' (Personaggi) section featuring bios for each of the characters in S&C - Sanjay Patel, Craig, Megan Sparkles, Hector Flanagan, Remington Tufflips, The Dicksons (I Dicksons; Sandy Dickson, Scabs Dickson and Baby Richard Dickson), Mr. Leslie Noodman and Belle Pepper - and a 'About The Show' page featuring information about Nick's brand-new animated comedy series! Follow NickALive! on Twitter, Tumblr, Google+, via RSS, on Instagram, and/or Facebook for the latest Nickelodeon Italy & Sanjay and Craig News! ils viennent hanter NICKELODEON à partir du 8 janvier à 20h05 ! Découvre la bande-annonce ! 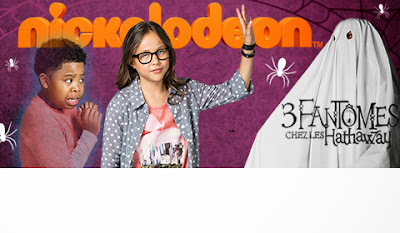 they haunt NICKELODEON from January 8 at 20:05! View the trailer! To celebrate Nickelodeon France debuting Nick's all new hauntingly good sitcom, Nick France has unveiled their official show webpage for the brand new show, which features show information, a 'Meet the Characters' section which features info about each character in "Haunted Hathaways" - Taylor Hathaway (Amber Montana), Frankie Hathaway (Breanna Yde), Michelle Hathaway (Ginifer King), Miles Preston (Curtis Harris), Louie Preston (Benjamin "Lil P-Nut" Flores Jr.) and Ray Preston (Chico Benymon) - and a special online streaming video clip featuring a exclusive sneak-peek at "3 fantômes chez les Hathaway", which NickHeads can visit at nickelodeon.fr! Nickelodeon France has also announced on their official homepage that the channel will start to premiere Nickelodeon's brand new original animated series (Nicktoon) "Sanjay and Craig", locally titled "Sanjay et Craig", very soon and are currently airing all-new episodes from "Big Time Rush" season four every Wednesday at 5:10pm (17:10)! Follow NickALive! on Twitter, Tumblr, Google+, via RSS, on Instagram, and/or Facebook for the latest Nickelodeon France and The Haunted Hathaways News! Boc-erk! Nick Jr. UK has announced the exciting news in their new "I'm Olive The Ostrich" promo/trailer and on their official websites "What's On" schedule section that Nickelodeon UK's preschool channel, Nick Jr. UK and Ireland, will start to show brand new episodes of Nick Jr. UK and Blue Zoo's popular animated preschool series "Olive The Ostrich", which will feature Olive's latest antipodean adventures, every weekday at 8:45am (repeated at 9:45am on Nick Jr. UK's plus-one (+1) timeshift channel, Nick Jr.+1) from Monday 6th January 2014, as part of "January 2014 on Nick Jr. UK"! Created using artwork by children aged 6-9 years from schools across the UK, each episode sees Olive bury her head in the sand and go on a different imaginary adventure. "Olive the Ostrich" is a CG-animated series for preschool kids which follows a young ostrich named Olive who goes on fun adventures to all sorts of amazing imaginary places. Each episode sees Olive bury her head in the sand and go on a different imaginary adventure. Animators bring to life real artwork drawn by children aged 6-9 years from schools across the UK, which are then integrated into the TV show. Inquisitive and enthusiastic, Olive loves to solve problems and help people whenever she can. She'll try anything once, which can get her into trouble, but always finds fun and inventive ways of getting herself out of it. "Olive the Ostrich" is narrated by the English stand-up comedian, actor and author Alexei Sayle ("The Young Ones", "Revelation of the Daleks", "The Comic Strip Presents...", "Horrible Histories", "Renford Rejects"). Follow NickALive! on Twitter, Tumblr, Google+, via RSS, on Instagram, and/or Facebook for the latest Nick Jr. UK and Olive The Ostrich News! regarde la bande-annonce du film, diffusé dimanche 29 décembre à 17h10, le 31 à 20h35 et le 1er janvier à 14h15 ! To celebrate Nickelodeon France premiering the all-new Nick Flick, the channels official website has unveiled a exclusive online streaming video clip featuring Nick France's official "Nicky Deuce" trailer/promo, which NickHeads located in France can watch here at nickelodeon.fr! Featuring an impressive cast including Noah Munck ("iCarly"'s Gibby), as well as "The Sopranos" stars Steve Schirripa, Michael Imperioli, Vincent Curatola, Tony Sirico and the late, great, James Gandolfini, "Nicky Deuce", based on a popular children's book by Steve Schirripa and Charles Fleming, sees Nicholas Borelli II (Munck), an over-protected teen, become a fish out of water when he gets caught in the adventure of a lifetime when his plans to attend math camp go awry and he is sent to spend the summer with an uncle (Schirripa). Nicholas leans on local kids to help him fit in and winds up mistakenly earning a reputation as a tough guy. When confronted with some questionable dealings, Nicky uncovers family secrets and learns that the mean streets of Brooklyn aren't always what they seem. "Nicky Deuce" also stars actor Cassius Crieghtney ("Degrassi: The Next Generation") and actress Rita Moreno ("Where on Earth Is Carmen Sandiego?"). Follow NickALive! on Twitter, Tumblr, Google+, via RSS, on Instagram, and/or Facebook for the latest Nickelodeon France and Nicky Deuce News! Nickelodeon Portugal has announced in the 'Noticias'/'News' section on their official website, nickelodeon.pt, the very exciting Nickelodeon Europe News that the Portuguese version of the world's number one kids' channel will start to premiere and show Nickelodeon's new live-action family comedy series "Wendell & Vinnie", which stars and is produced with Nickelodeon Productions by Nickelodeon Star and "iCarly" actor Jerry Trainor, from Monday 6th January 2014 at 9:10pm (21:10), as part of Nick Portugal's Winter 2013 programming highlights! Follow NickALive! on Twitter, Tumblr, Google+, via RSS, on Instagram, and/or Facebook for the latest Nickelodeon Portugal and Wendell & Vinnie News! Nickelodeon's Northern European Channels Announce Premiere Dates For New CG-Animated Show "Rabbids Invasion"
To celebrate Nick networks across Northern Europe debuting the brand new Nicktoon "Rabbids: Invasion", each countries official Nickelodeon website has unveiled a local "Rabbids: Invasion" show webpage, which features exclusive online videos (including the shows launch trailer) and a exclusive photo gallery featuring pictures of each character! "Rabbids Invasion" is a all-new 26 half-hour episode series that follows the Rabbids as they discover, explore, and often wreak havoc in the human world. For the Rabbids, everything is a source of wonder and amusement, and these indestructible and uncontrollable creatures have absolutely no respect for the social rules that govern society. There are no laws, no rules of the road. They are all about having fun and their only language is a crazy-sounding "Bwaaaaaah!". The show is based on Ubisoft's popular "Raving Rabbids" video game franchise. Nickelodeon recently ordered a second season of the networks hit CGI-animated series "Rabbids Invasion". Follow NickALive! on Twitter, Tumblr, Google+, via RSS, on Instagram, and/or Facebook for the latest Nickelodeon Northern Europe and Rabbids Invasion News! 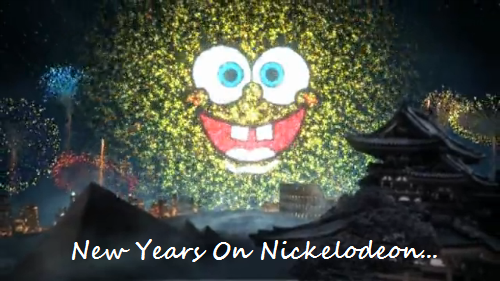 2014 On Nickelodeon UK, NickToons, And Nick Jr. Please note, that unless confirmed, all premiere dates are yet to be confirmed by Nickelodeon UK. "The Thundermans" is a brand-new superhero-themed comedy series that follows a pair of superhero twins, Phoebe Thunderman (Kira Kosarin) and Max Thunderman (Jack Griffo), with opposite personalities, who must navigate their way through school, friends and a family of extraordinary superheroes, all while keeping their true identities a secret. Phoebe and Max Thunderman are 14-year-old fraternal twins turbocharged by freeze breath and the power to move objects via telekinesis. Phoebe, a good-natured sister, always tries to do the right thing, while Max, a troublemaker, dreams of one day becoming a super villain. Brother Billy (Diego Velazquez) moves at super speed, while younger sister Nora (Addison Riecke) cuts solid objects with her laser beam eyes. Rounding out the family are parents Hank (Chris Tallman), who possesses extraordinary strength and the ability to fly, and Barb (Rosa Blasi), who can generate lightning from her hands. Ultimately, the family must attempt keep their powers under wraps and lead a "normal" life... but can life ever be "normal" in a family of superheroes? Brand New Show: "The Greenhouse" - Confirmed TX: January 2014: Nickelodeon UK, the number one commercial kids TV network in the UK, has announced that Nickelodeon UK and Ireland and Nickelodeon HD UK will start to premiere and show the brand-new original scripted daily drama series "The Greenhouse" from Monday 6th January 2014 at 6:30pm (replayed at 7:30pm on Nick UK's plus-one timeshift channel, Nick+1), as part of "2014 on Nickelodeon UK"! Following the debut, Nick UK & Eire will then continue to air all-new episodes of "The Greenhouse" every Monday to Thursday at 6:30pm (repeated at 7:30pm on Nickelodeon+1), and encore each new episode every in a special omnibus every Sunday between 7pm and 9pm from Sunday 12th January 2014! 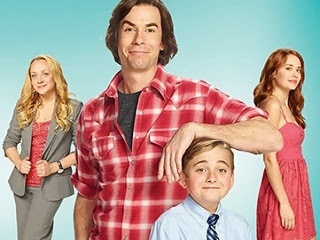 In Nickelodeon's brand new original scripted daily drama series "The Greenhouse", after losing their mother in a spaceship accident, a brother and sister arrive at an elite boarding school for gifted future leaders. They join two competing houses within the school and become rivals. Soon, mysterious and disturbing developments draw both groups into a secret investigation. The students of the school uncover a deadly plot to destroy the planet. Only by joining forces and working together, they will be able to save the world. "The Greenhouse" is an original scripted drama for boys and girls aged between 8-15. 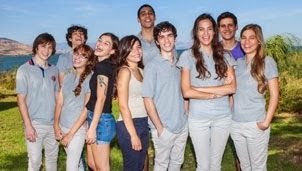 Nickelodeon's "The Greenhouse" was created by Giora Chamitzer, one of the leading creative minds in Israeli television, who also serves as the shows Show Runner. "The Greenhouse" is Produced by Nutz Productions and Ananey Communication, and debuted on Nickelodeon Israel as a daily drama on 17th December 2012. New Show: Mia and Me - Confirmed TX: January 2014: Nick UK has announced that Nickelodeon UK and Ireland and Nickelodeon HD UK will start to premiere and show the brand-new popular live action/CGI animated hybrid fantasy television series "Mia and Me" every Saturday and Sunday (Weekends) at 7:00am (replayed at 8:00am on Nick UK's plus-one timeshift channel, Nick+1) from Saturday 4th January 2014! 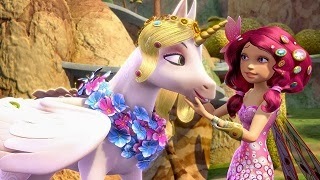 "Mia and Me" follows the adventures of a 12-year-old girl who leads a double life in a magical land filled with unicorns. The story begins when a girl named Mia, whose parent's tragically died when she was young, goes to a boarding school in Italy. Mia's aunt gives Mia a game that her father, a successful game maker, made before he died. Through the game, Mia finds herself hurled into the wondrous world of Centopia, full of elves, unicorns, pans and dragons. But the once idyllic kingdom is in danger. Evil Queen Panthea seeks to capture the unicorns and harness their power to keep her self young. The valiant elves, led by Prince Mo and daring warrior Yuko, plus Pan Phuddle, fight to stop her. Thanks to her unique ability to communicate with unicorns, Mia must safeguard the golden-horned Onchao. As Mia bounces between trying to fit in at her new school and her life as a fairytale elf, she becomes the key to saving Centopia. New Episodes: Winx Club Season Six - Expected: Spring/Summer 2014: Nickelodeon UK has announced the Winx-Tastic Nick UK news that Nickelodeon UK and Ireland and Nickelodeon HD UK will start to premiere and show brand new episodes from the brand new 26-episode sixth season of the popular animated television series "Winx Club" in Spring/Summer 2014, as part of Nick UK and Eire's Spring/Summer 2014 programming highlights! Additionally, Nickelodeon UK have also announced plans to release a brand new "Winx Club" app in 2014! In the sixth season of "Winx Club", Daphne returns to her kingdom of Domino in her physical being. Although she faces the challenge of living in the flesh, Bloom and the Winx help her adapt to the life on Magix. Meanwhile, the Trix are back to their old ways. There is also the addition of a new witch at Cloudtower by the name of Selina, who possesses a magic storytelling book called the Legendarium that can bring forth fictional stories into the real world. New Episodes: The Legend of Korra: Book Two: Spirits - Expected: Spring/Summer 2014 (TBC): Nickelodeon UK is expected to start to premiere and show the brand new second season of Nickelodeon's hit original animated series (Nicktoon) "The Legend of Korra", called "Book Two: Spirits", in Spring/Summer 2014! "Book 2: Spirits" will follow Korra's quest to become a fully realized Avatar. "The Legend of Korra" season 2 will also introduce several intriguing new characters to Korra's world. Fans will get to meet Korra's extended family for the first time, which includes her imperious uncle Unalaq and impassive twin cousins Desna and Eska. In addition, a specially-designed flashback episode will introduce fans to Wan, the very first Avatar, who will be voiced by Steven Yuen of "The Walking Dead". Nickelodeon UK is also expected to continue to premiere and show more brand new episodes of hit shows, including "Sam & Cat", "The Haunted Hathaways", "Dance Academy", "Extreme Babysitting", "Figure It Out" and "Life with Boys", plus add more content to the newly launched Nick App in 2014. New Episodes: Teenage Mutant Ninja Turtles Season 2 - Confirmed TX: January 2014: Nickelodeon's Heroes in a Half-Shell return to battle when Nick UK's animation and action channel, Nicktoons UK and Ireland, starts to premiere and show brand new episodes from "Teenage Mutant Ninja Turtles" season 2 every Saturday at 9:30am from Saturday 11th January 2014, continuing the shell-raising crime-fighting adventures of the four mutant Heroes in a Half-Shell turtles — Leonardo, Raphael, Donatello and Michelangelo! NickToons UK & Eire will repeat each brand new episode the same day at 6:00pm! Season two starts off with a bang in the premiere episode, "The Mutation Situation". 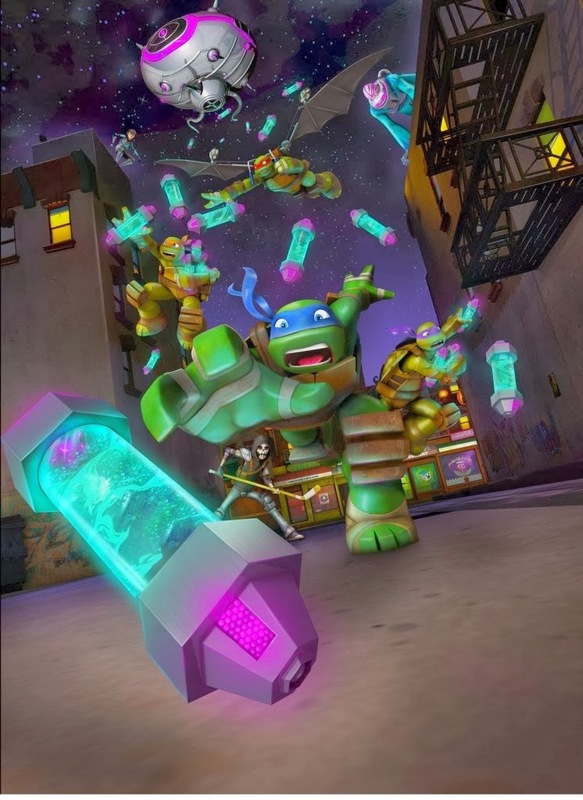 The Turtles discover that the alien Kraang survived their previous showdown and now have dropped mutagen canisters all over NYC. Throughout the season, the Turtles' mission is to recover the canisters before more mutants can be created. Meanwhile, the Kraang and Shredder have united to put an end to the Turtles once and for all which results in some infamous characters coming after the brothers. With the help of Casey Jones, each new episode will see the Turtles take on a new villain, all while trying to unravel the mystery regarding April O’Neil and her importance to the Kraang. After each episode, British and Irish Shellheads can go to Nick UK & Ireland's official "Teenage Mutant Ninja Turtles" website, turtles.nick.co.uk and find out more about the villain revealed that week. Each new character will then be added to an interactive digital poster of New York City which will be available to download once all of the villains have been revealed. New Show: Rabbids Invasion - Expected TX: February 2014: Nickelodeon UK's animation and action channel, Nicktoons UK and Ireland, is expected to start to premiere and show Nickelodeon and Ubisoft's brand new CG-animated series "Rabbids Invasion" from February 2014! "Rabbids Invasion" is a all-new 26 half-hour episode series that follows the Rabbids as they discover, explore, and often wreak havoc in the human world. For the Rabbids, everything is a source of wonder and amusement, and these indestructible and uncontrollable creatures have absolutely no respect for the social rules that govern society. There are no laws, no rules of the road. They are all about having fun and their only language is a crazy-sounding "Bwaaaaaah!". 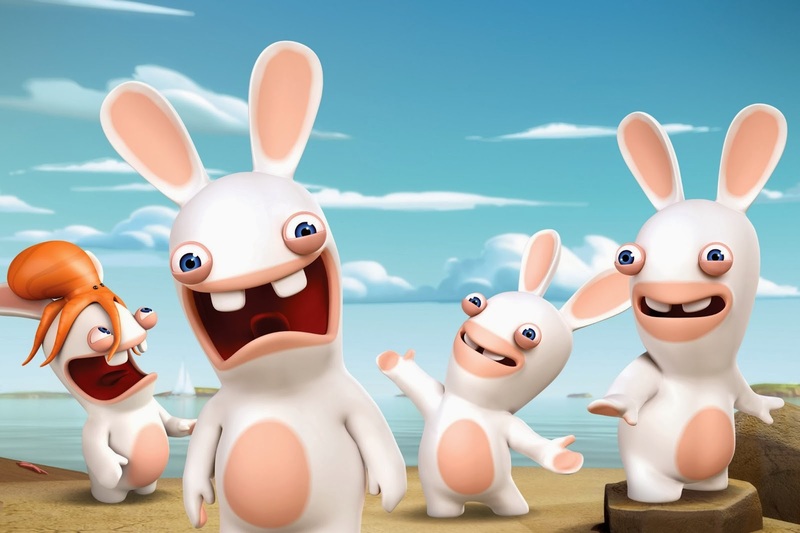 The show is based on Ubisoft's popular "Raving Rabbids" video game franchise. New Show: Breadwinners - Expected TBA: Autumn/Winter 2014: Nickelodeon UK's animation and action channel, Nicktoons UK and Ireland, is expected to start to premiere and show Nickelodeon's bread-tastic brand new original animated comedy series (Nicktoon) "Breadwinners" from Autumn/Winter 2014. "Breadwinners", the best thing since sliced bread, is a all-new animated series that follows two booty-shaking carefree ducks called SwaySway and Buhdeuce who fly around in a super sweet rocket van, delivering bread to their hungry customers. The best buds live together, laugh together, and get into all sorts of riDUCKulous adventures together on their planet Pondgea. No matter what, nothing stops these two friends from having 24/7 fun and a getting a little bit QUAZY! Look out for bucket loads of delicious bread, head boppin' music, and non-stop booty-shakin' dance parties. Coming soon! YEAH BOYEEEEEE! 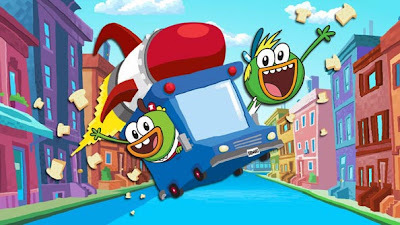 "Breadwinners" is created by Gary "Doodles" DiRaffaele ("MAD", "Metalocalypse"), who was discovered from Nick's 2012 Animated Shorts Program, and Steve Borst ("Teen Titans Go! ", "MAD"). New Series: Power Rangers Super Megaforce - Expected TX: Autumn/Winter 2014: Nickelodeon UK's animation and action channel, Nicktoons UK and Ireland, is expected to start to premiere and show the latest season, season 21, in the popular "Power Rangers" franchise, "Power Rangers Super Megaforce", in Autumn/Winter 2014. The upcoming season of "Power Rangers Super Megaforce" focuses on the Rangers' mission to defeat a massive alien army Armada that was sent to conquer Earth. To face this threat, Gosei, a supernatural guardian who has protected Earth for centuries, gives the Rangers special morphers and keys, which allow them to morph into Super Megaforce Rangers. The Rangers also have an added special ability to morph into any team of Power Rangers from the past. These super-sized adventures can only mean one thing: the all-new Power Rangers Super Megaforce has arrived, and will feature special morphing powers and SUPER MEGA action! Nickelodeon and Saban Brands have also revealed "Power Rangers Super Megaforce" will feature what is one of the most highly anticipated moments in television history – The Power Rangers Mega War! Taking inspiration from the original "Super Sentai" TV series (which the "Power Rangers" series is based on and uses footage from), the Mega War features the return of ever single Ranger, who must band together against an imposing force. Nicktoons UK is also expected to continue to premiere and show more brand new episodes of popular shows, including "SpongeBob SquarePants", "The Fairly OddParents! ", "Matt Hatter Chronicles" (including season two), "Monsters vs. Aliens", "Sanjay and Craig", and "Rocket Monkeys". New Show: Bad Seeds (Nickelodeon pilot): From "SpongeBob SquarePants" alumnus and Chowder creator Carl Greenblatt, "Bad Seeds" is about a good bird running with the bad crowd... and having a great time! New Show: KushaBOOM - Expected TX: January 2014: Get ready to get up and get dancing! Nick Jr. and Nickelodeon UK presenter Helena Dowling has announced the very exciting Nick UK News to NickALive! that Nickelodeon UK's preschool channel, Nick Jr. UK and Ireland, will start to premiere and show their brand new UK produced dance themed short-form preschool series "Kushaboom" in January 2014, as part of "2014 on Nick Jr. UK"! "Kushaboom" (8x5') is a brand new preschool series set in a enchanted dance studio and features a group of four children, who will make up the 'Kushaboom crew', joining Nick Jr. and Nickelodeon presenter Helena Dowling (pictured) and her puppet co-presenter, DJ Kusha, for a very special dance class. Using the mechanic of a magical dance floor that transforms into a globe, every episode will take the audience on a geographical adventure where they will explore a different dance culture and learn corresponding dance moves. The series, filmed in Hackney, London will also feature a child actress from the Stagecoach Theatre Arts Weymouth performing arts school and work by London-based artist, TV art department assistant and theatre set designer Nick Spalding. New Episodes: "Poppy Cat" Series Two - Expected TX: Spring 2014: Nickelodeon UK's preschool channel, Nick Jr. Channel UK and Ireland, will start to premiere and show the brand new second series of the popular animated television series "Poppy Cat" from Spring 2014. Additionally, Kennedy Enterprises will launching a all-new stand-alone Poppy Cat magazine to build on the brand's momentum and growth in the UK in Spring 2014, which will focus on the adventurous pussycat and her colourful friends, and will feature branded stickers, posters, mini activity booklets, and interactive reward stickers to make learning more fun, plus branded "Poppy Cat" cover mounts (promotional toys and gifts). "Poppy Cat", starring the voice of Joanna Page ("Gavin & Stacey") and airing everyday on Nick Jr. UK and Nick Jr. 2, is based on the award-winning books created by Lara Jones, which have sold more than 2.5 million copies. The second series of the top-rating programme - launching in 2014 - is co-produced by Coolabi's television production arm, Coolabi Productions, and the Emmy shortlisted and BAFTA award-winning, King Rollo Films. New Show: Driftwood Bay - Expected TX: Spring 2014: Nickelodeon UK's preschool channel, Nick Jr. UK and Ireland is expected to premiere and start to show the brand new mixed media animated preschool series "Driftwood Bay" from Spring 2014. 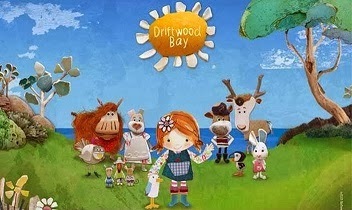 Produced by Belfast-based independent children's television production company Sixteen South Television, "Driftwood Bay" is set on an island that exists in the mind of a little girl. She creates adventures and friendships from the different treasures she finds washed up on beach where she lives. The show comes from children's artist Joanne Carmichael, who created the characters from items she found outside her beach hut on the Scottish island of Arran. New Show: Puffin Rock - Expected TX: October 2014: Cartoon Saloon, an Academy Award nominated Irish Animation Studio based in Kilkenny, has announced the exciting Nick Jr. UK news that Nickelodeon UK's preschool channel, Nick Jr. UK, has picked up the broadcast rights to "Puffin Rock", a brand new animated children's TV series narrated by Irish actor Chris O'Dowd ("Bridesmaids", "The IT Crowd", "Moone Boy", Nickelodeon and DreamWorks Animation's "Monsters Vs. Aliens" TV series)! Co-produced by Oscar nominated Irish animation studio, Cartoon Saloon, global publisher Penguin, and Northern Irish children's media company, Dog Ears, "Puffin Rock" will be broadcast by Nick Jr. in the UK and RTÉjr in Ireland. Production will commence in September 2013 and delivery will begin in October 2014. "Puffin Rock" is a multi-platform brand that follows the adventures of a family of puffins living on a wild and beautiful Irish island. Pip, an adventure-loving young Puffling, and the hero of the show, explores the island with her little brother Baba – making friends, hunting for food and trying to stay off the dinner menu. The TV series will feature 39 seven-minute episodes (39 x 7') and Penguin will produce digital and physical format books, and products, to accompany the series. New Show: Wallykazam - Expected TX: Autumn/Winter 2014 (TBC): Nick Jr. UK and Ireland is expected to start to premiere and show Nickelodeon Preschools brand new animated preschool series "Wallykazam", about a little boy, his miniature pet dragon and a magic stick, from Autumn/Winter 2014. "Wallykazam" is Nickelodeon's first literacy show for preschoolers that embeds the curriculum into a rich narrative story, with the goal of helping kids fall in love with words and inspiring them to read. The original comedy follows the adventures of a boy named Wally Trollman and his pet dragon, Norville. Wally has a magic stick that makes words come to life and playfully transforms the world around him. New Show: Blaze and the Monster Machines - Expected TX: Autumn/Winter 2014 (TBC): Nick Jr. UK and Ireland is expected to start to premiere and show Nickelodeon Preschools brand new CGI-animated preschool series "Blaze and the Monster Machines" from Autumn/Winter 2014. "Blaze and the Monster Machines", a original CG-animated series introduces preschoolers to the areas of science, technology, engineering and math (STEM). This is the first preschool show that features a curriculum dedicated to all areas of STEM. Viewers will join an eight-year-old boy named AJ and his incredible monster truck Blaze on super-sized adventures. AJ and the viewer help Blaze as they explore the physics of how things move, master mathematics and discover how everyday technologies work. The series, which received a 20-episode order, will debut on Nickelodeon USA in 2014. "Blaze and the Monster Machines" created by Jeff Borkin (head writer, "Team Umizoomi", "Little Einsteins") and Ellen Martin (producer, "Bubble Guppies", "The Backyardigans"). Nick Jr. UK and Ireland is also expected to continue to premiere and show more brand new episodes of popular shows, including "A Bedtime Story", "Thomas and Friends", "Ben & Holly's Little Kingdom", "Peppa Pig", "Bubble Guppies", "Dinosaur Train", "Dora the Explorer", "Olive the Ostrich", "Let's Go Pocoyo", "Poppy Cat", "Team Umizoomi", "PAW Patrol" and "Tickety Toc", plus brand new music videos and a all-new live tour from the "The Go!Go!Go! Show" gang! Additionally, Spin Master Entertainment, who co-produces the series with Nickelodeon and the property's master toy licensee, will launch and release a "Paw Patrol" consumer product line, including a toy line in the UK during the Autumn (Fall)/Winter 2014 season! Monty and Norville (Nickelodeon preschool series/working title): "Monty and Norville" follows the adventures of a five-year-old troll named Monty and his dragon friend Norville. With the help of viewers at home, Monty can use his magic stick to make incredible things happen as long as he uses the right words. The new animated 26-episode series, created by Adam Peltzman (head writer, "Blue's Clues", "The Backyardigans"), will introduce a literacy curriculum to Nickelodeon's preschool audience. Shimmer and Shine: (working title): "Shimmer and Shine" follows the magical adventures of genie twin sisters Shimmer and Shine and their human best friend Leah, who, when needing help with various dilemmas, is granted three wishes after summoning the genies with a rub of her oil lamp pendant necklace. Misadventures ensue however when Shimmer and Shine often misinterpret what Leah wishes for and accidentally grant her the wrong wishes. Leah must then use non-magical problem-solving skills to fix her problems. Teri Weiss, Executive Vice President (EVP) of production and development for Nickelodeon Preschool, describes the series as a show which teaches kids that it's okay to make mistakes and explore the unintended, with often positive consequences of doing so. "Shimmer and Shine" is helmed by Nickelodeon's homegrown talent Farnaz Esnaashari-Charmatz ("Dora the Explorer"), and her team, including writer Sindy Boveda Spackman ("Robot and Monster", "The Fairly OddParents") and art director Andy Bialk ("Cloudy with a Chance of Meatballs"). Coming in 2015 - "Dora and Friends": "Dora and Friends" is a brand new animated spin-off series from Nickelodeon's massively popular preschool series "Dora the Explorer" which will star Latina heroine Dora the Explorer as a 10-year-old (Tween), who, with her four new friends - super sporty Alana, musical Emma, theatrical Kate and star-gazing Naiya (also known as the Explorer Girls) - and a bit of magic, explore an enchanted city, which has surprises around every corner. January 2014 On Nickelodeon UK, NickToons, And Nick Jr.
Nickelodeon UK's latest January 2014 schedule highlights and upcoming events will be posted at the top of each Nick channels category in this NickALive! Nickelodeon UK blog post as they are announced. It's the start of a fresh new year, and Nickelodeon UK is celebrating with more brand new action-packed shows and thrilling all-new episodes packed in with all your current favourite Nick shows! Nickelodeon UK will kick of 2014 with a all-day "Victorious" marathon! Catch back-to-back episodes featuring the best moments, memories and highlights of Tori Vega's (portrayed by Nickelodeon Star Victoria Justice) Platinum career, including the "VICTORiOUS" TV specials "Freak The Freak Out" and "Locked Up!"! Brand New Show - "The Greenhouse": Nickelodeon UK, the number one commercial kids TV network in the UK, has announced that Nickelodeon UK and Ireland and Nickelodeon HD UK will start to premiere and show the brand-new original scripted daily drama series "The Greenhouse" from Monday 6th January 2014 at 6:30pm (replayed at 7:30pm on Nick UK's plus-one timeshift channel, Nick+1), as part of "2014 on Nickelodeon UK"! Following the debut, Nick UK & Eire will then continue to air all-new episodes of "The Greenhouse" every Monday to Thursday at 6:30pm (repeated at 7:30pm on Nickelodeon+1), and encore each new episode every in a special omnibus every Sunday between 7pm and 9pm from Sunday 12th January 2014! New Show - Mia and Me: Nick UK has announced that Nickelodeon UK and Ireland and Nickelodeon HD UK will start to premiere and show the brand-new popular live action/CGI animated hybrid fantasy television series "Mia and Me" every Saturday and Sunday (Weekends) at 7:00am (replayed at 8:00am on Nick UK's plus-one timeshift channel, Nick+1) from Saturday 4th January 2014, as part of "2014 on Nickelodeon UK"! New Episodes - Teenage Mutant Ninja Turtles Season 2: Nickelodeon's Heroes in a Half-Shell return to battle when Nick UK's animation and action channel, Nicktoons UK and Ireland, starts to premiere and show brand new episodes from "Teenage Mutant Ninja Turtles" season 2 every Saturday at 9:30am from Saturday 11th January 2014, continuing the shell-raising crime-fighting adventures of the four mutant Heroes in a Half-Shell turtles — Leonardo, Raphael, Donatello and Michelangelo! NickToons UK & Eire will repeat each brand new episode the same day at 6:00pm! After each episode, viewers can go to turtles.nick.co.uk and find out more about the villain revealed that week. Each new character will then be added to an interactive digital poster of New York City which will be available to download once all of the villains have been revealed. New Show - KushaBOOM: Get ready to get up and get dancing! Nick Jr. and Nickelodeon UK presenter Helena Dowling has announced the very exciting Nick UK News to NickALive! 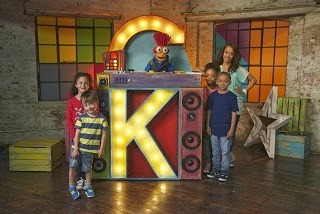 that Nickelodeon UK's preschool channel, Nick Jr. UK and Ireland, will start to premiere and show their brand new UK produced dance themed short-form preschool series "Kushaboom" in January 2014, as part of "2014 on Nick Jr. UK"! "Kushaboom" (8 episodes x 5 minutes) is a brand new preschool series set in a enchanted dance studio and features a group of four children, who will make up the 'Kushaboom crew', joining Nick Jr. and Nickelodeon presenter Helena Dowling (pictured) and her puppet co-presenter, DJ Kusha, for a very special dance class. Using the mechanic of a magical dance floor that transforms into a globe, every episode will take the audience on a geographical adventure where they will explore a different dance culture and learn corresponding dance moves. The series, filmed in Hackney, London will also feature a child actress from the Stagecoach Theatre Arts Weymouth performing arts school and work by London-based artist, TV art department assistant and theatre set designer Nick Spalding. December 2013 On Nickelodeon UK, NickToons, And Nick Jr.
Nickelodeon UK's latest December 2013 schedule highlights and upcoming events will be posted at the top of each Nick channels category in this NickALive! Nickelodeon UK blog post as they are announced. It's beginning to look a lot like Nickelmas, and Nickelodeon UK has the perfect winter entertainment for you this holiday season, including brand new episodes plus a selection box filled with tons of Christmas specials and festive movies based on your favourite Nickelodeon shows, to make sure you have Appy Holidays and a Cracking Nickmas! Christmas Day on Nickelodeon: Nickelodeon UK has announced Nick's, Nicktoons, Nickelodeon HD's, Nick Jr. Xmas's and Nick Jr. 2's Christmas Day (Wednesday 25th December 2013) schedule highlights, which Nickelodeon UK will show as part of Nickelodeon UK's "Christmas On Nickelodeon 2013"! With everyone's favourite shows, marathons and movies, Nickelodeon has your Christmas telly all wrapped up! Christmas Eve on Nickelodeon: Nick UK has unveiled Nickelodeon UK's, Nicktoons UK's, Nick Jr. Xmas's and Nick Jr. 2's Christmas Eve 2013 Highlights! Click here to find out what Father Nickmas has in store for everyone this Christmas Eve! New Movie - Jinxed! : Cross your fingers and wish for luck as Nickelodeon UK gets Jinxed! Nickelodeon UK, the number one commercial kids TV network in the UK, has announced that Nickelodeon UK and Ireland and Nickelodeon HD UK will premiere and show the brand new Nickelodeon Original TV Movie "Jinxed" on Friday 6th December 2013 at 7:00pm (replayed at 8:00pm on Nick UK's plus-one timeshift channel, Nick+1), only one week after the film debuts on Nick USA! Appy Christmas: 'Tis the season to be a finger! Nickelodeon UK and Ireland, the number one commercial kids TV network in the UK, has announced in their brand new trailer the very exciting Nick UK News that Nickelodeon UK will be launching a local version of the popular Nick App in the UK and Ireland on Thursday 28th November 2013, and to celebrate Christmas and the launch of the brand new free Nick App in the UK, Nickelodeon will be hosting a exclusive 'Watch and Win' competition called "Appy Christmas", where Nick will be showing great Christmas episodes of all your favourite Nick shows, including the brand new "Life With Boys" Christmas special "Naughty and Nice With Boys", and will be giving British and Irish NickHeads the chance to win a iPad Mini everyday from Sunday 1st to Tuesday 24th December 2013, making it a very Appy Christmas!! New Episodes - Big Time Rush: British and Irish Rushers get ready, the all-singing, all-dancing, all American boys are back! Nickelodeon UK and Ireland and Nickelodeon HD UK will continue to premiere more brand new episodes of Nickelodeon's hit live-action original musical comedy series "Big Time Rush" and debut the fourth and final season of BTR in December 2013, including the all-new episodes "Big Time Cartoon", "Big Time Break Out", and the one-hour series finale special "Big Time Dreams", where the BTR boys go to the Tween Choice Awards, as part of Nickelodeon UK's Autumn/Winter 2013 highlights! New Rocket Monkeys Christmas Special: In Space, no one can hear the Monkey Carols... Oh, wait, they can! Nickelodeon UK, the number one commercial kids TV network in the UK, has announced in their brand new trailer the very exciting Nick UK News that, to celebrate the Christmas season, Nick UK's animation and action channel, Nicktoons UK and Ireland, will premiere and show the brand new Christmas special episode of the Canadian animated comedy series "Rocket Monkeys", titled "The Peel Who Stole Christmas", in which the Monkey brothers, Gus and Wally go tinsel, on Sunday 1st December 2013 at 9:30am, as part of NickToons UK's "SpongeBob's Cracking Christmas" programming highlights! 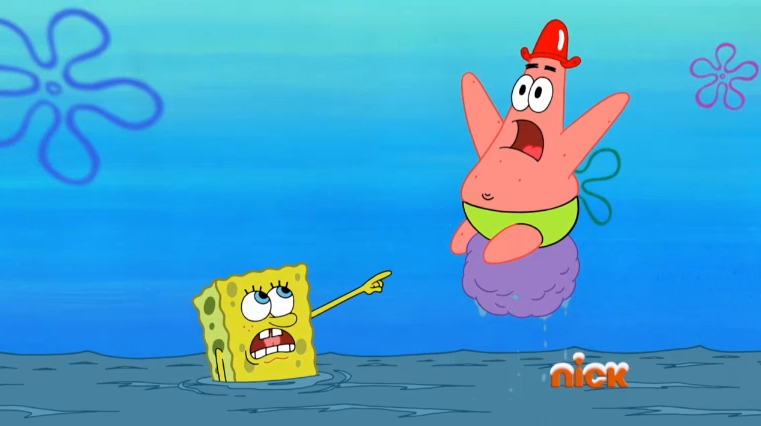 SpongeBob's Cracking Christmas: 'Tis the season to be a SpongeBob SuperFan! Nickelodeon UK, the number one commercial kids TV network in the UK, has announced in their brand new trailer the very exciting Nick UK News that, to celebrate the Christmas season, Nick UK's animation and action channel, Nicktoons UK and Ireland, will be hosting a brand new and exclusive "SpongeBob SquarePants"-themed 'Watch and Win' competition called "SpongeBob's Cracking Christmas", where NickToons will be giving British and Irish SpongeBob fans the chance to win Sponge-Tastic SpongeBob prizes! New The Go!Go!Go! Show Music Video - "I Love Christmas Time": "The Go!Go!Go! Show" has announced the very exciting news that Nick Jr. UK and Ireland will start to show "The Go!Go!Go! Show"'s brand new Christmas song called "I Love Christmas Time", featuring Carl, Gemma, Jade, Holly, Steve, the inquisitive Mr. Baffled and his sidekick, the sock-munching Fluffalope - from Sunday 1st December 2013, as part of Nick Junior's festive programming highlights! New PAW Patrol Christmas Special: Nick Jr. UK has announced the PAWsome news that Nick Jr. UK and Ireland will premiere and show the brand new Christmas special episode of Nickelodeon Preschools all-new hit CGI-animated preschool series "PAW Patrol", called "Pups Save Christmas", on Sunday 1st December 2013 at 12:00pm (repeated at 1:00pm on Nick Junior UK's plus-one (+1) timeshift channel, Nick Jr.+1), as part of the channels festive programming highlights! New Tickety Toc Christmas Special: Nick Jr. UK and "Tickety Toc" UK have announced the Tick Tocktastic news that Nick Jr. UK and Ireland will premiere and show the brand new Christmas special episode of Nick Juniors' popular animated preschool television series "Tickety Toc", titled "Christmas Present Time", plus brand new episodes of "Ben and Holly's Little Kingdom", over the weekend of Saturday 30th November 2013 and Sunday 1st December 2013, as part of the channels Christmas programming line-up! New Episodes - Team Umizoomi: This winter take a trip to Umi City where the streets are paved with origami, the pavements are swirled with colour and even the manhole covers have whimsical patterns embedded within! There you will find Team Umizoomi, Geo, Bot and Milli, a trio who solve everyday problems with their Mighty Maths Powers in order to keep Umi City running smoothly. In new brand-new episode "The Boy with the Dragon Skateboard", Team Umizoomi is visiting the Umi City Skate Park with their friend Logan, who has an amazing dragon skateboard and can do all kinds of cool tricks. But when Umi City's newest villains, the Troublemakers, appear on the scene they do the unthinkable – they break Logan's skateboard and send the pieces flying. Now it's up to Team Umizoomi to collect the skateboard pieces and put it back together. Then, in "City of Lost Penguins", Geo, Bot and Milli are at the UmiCity Zoo viewing the newest animal attraction – 50 baby penguins! But when the Troublemakers wreak havoc by letting all the penguins loose, it's up to Team Umizoomi to collect all the lost penguins and return them to their home! 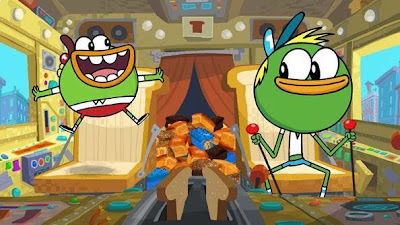 It is being reported in a post on Nick.com's official "Breadwinners" message board/forum that Nickelodeon USA has announced in a brand new promo/trailer that Nick USA will start to premiere and show the networks bread-tastic brand new original animated comedy series (Nicktoon) "Breadwinners" in February 2014, as part of "2014 on Nickelodeon"! Please note, however, that this Nickelodeon News is currently unconfirmed by Nickelodeon. Stay tuned to NickALive! for more news about Nickelodeon's brand new animated show "Breadwinners" as it's announced! To celebrate and promote Nick USA debuting "Breadwinners" soon, Nickelodeon has also launched their all-new "Breadwinners" Tumblr blog, breadwinners.tumblr.com, which is full of quazy pics, quazier videos, and the quaziest animated GIFs featuring characters from the show! Follow NickALive! on Twitter, Tumblr, Google+, via RSS, on Instagram, and/or Facebook for the latest Nickelodeon and Breadwinners News! To celebrate, below is a selection box of great festive Nickelodeon Christmas videos, plus all four songs from Ariana Grande's 'Christmas Kisses' EP, and three of Nickelodeon UK's Christmas Pantomania pantomimes featuring Classic Nick UK presenters telling their own versions of classic fairy tales, to get you rocking around the Nickmas tree! Enjoy! Don't forget to tell NickALive! what Santa Claus brought you for Christmas this year and what has been your favourite Christmas present ever! Get in touch on Twitter, Tumblr, Google+, on Instagram, and/or Facebook!